Tvakh's Facial Oil is a wonder-working oil to caress the skin with the combination of world-class essential oils. Sustainable, because of the use of Chia seed oil that has perfect 3:1 ratio of omega 3 to omega 6 essential fatty acids combined with amino acids, B-vitamins, and minerals, makes it a food for your ageing skin. 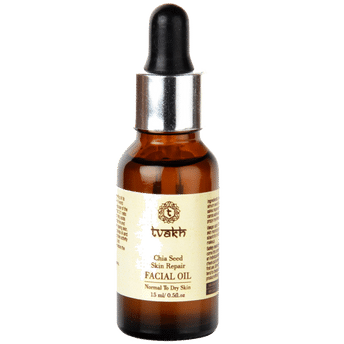 Formulated with Hemp seed oil, Karanja Oil and Rice Bran Oil that exert a more complex activity in protecting skin nourishing it and removing its superficial layers to restore the youthful glow.